Eternal Sunshine of the Spotless Mind is a breath of fresh air when it comes to on screen romance. I will begin by saying, this is a must see film; an absolute must see film. If you’re confused by my recommendation on your first viewing of Eternal Sunshine of the Spotless Mind, then watch it again, but this time – really see it. Follow every line, and understand every visual, take it all in and let the film run away with your mind. Eternal Sunshine is without a doubt an extremely polished film that delivers on all fronts; it ticks all the boxes. The storyline is complex and totally far fetched, but is utterly unique and something very beautiful. Joel Parish (Jim Carrey) is an ordinary guy with an ordinary existence. When we’re first introduced to his character he starts the day off with the aim of going to work, but whilst waiting for the train, something out of the ordinary happens to Joel; he runs across the platform and jumps on a train to Montauk – a completely spontaneous act. Whilst Joel walks across Montauk beach he sees a girl with an orange sweatshirt on, also walking along the sand. Clementine Kruczynski (Kate Winslet) introduces herself on the train and that is where their story begins or so you would believe. 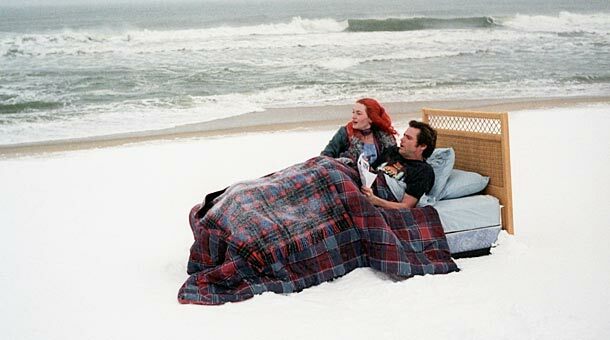 Eternal Sunshine of the Spotless Mind is anything but ordinary. The film takes you down so many different visual paths that you find it difficult to place each scene. You find yourself understanding Joel’s anger towards what has happened in his life but you also feel the pain of his past when he’s confronted by his memories. Early on Joel decides to undergo a ‘new-age’ therapy that will eliminate all the memories that cause him pain and betrayal he felt during his relationship with Clementine; we find out soon enough that he regrets this decision. Clementine is a character that can be defined by her own words “Too many guys think I’m a concept, or I complete them, or I’m gonna make them alive. But I’m just a fucked-up girl who’s lookin’ for my own peace of mind; don’t assign me yours.” This speech she gives to Joel is one of the most realistic and direct definition of what women like Clementine are portrayed as through film. She doesn’t pretend to be another ‘Ruby Sparks’ or ‘Allison’ (from Yes Man! also starring Jim Carrey) – she isn’t the girl that breathes life back into the empty chests of men without colour or direction to the world they live in. Clementine is simply a girl who makes mistakes and is looking for some direction of her own. Opposites surely do attract in Eternal Sunshine. Joel is “boring” and Clementine, “impulsive” – quite a clash in terms of the chemistry within a relationship. Due to their conflicting personalities, harsh realisations are made apparent and the couple are left to deal with the emotions that are brought to the surface. During the course of the film we get to see both sides of their relationship through various memories Joel is reliving. Through this we get to see the good, the bad and the downright ugly; yet when their relationship is good, it’s beautiful. A memorable scene that demonstrates this is when Clementine describes a deep rooted childhood memory to Joel, from where she first decided she was ugly; Joel begins kissing her and tells her she’s pretty over and over again until they fade into a new memory. With fantastic use of cinematography, the director (Michel Gondry) and the DOP (Ellen Kuras) produced phenomenal shots and scenes (including the one just described) by using light, colour and intense intimacy between the subjects, they bought to life the powerful emotion of each memory. This is outstanding filmmaking. This said, I must also give credit to Carrey and Winslet for their performances as both were out of their comfort zones. Carrey, more known for his humour and comedic roles and Winslet for her super serious Britishness – both delivered fresh and very realistic portrayals of what two people in a dysfunctional relationship are like and how they survive through the love and understanding they share for one and other. Eternal Sunshine of the Spotless Mind is a breath of fresh air when it comes to on screen romance and I rate it highly among the films I adore.